You've arrived! Welcome to the world of professionals who recognize the intrinsic value in plastic cards. Business card printing has evolved over the past decade with advanced custom printing options that are both memorable and engaging! The average corporate business card needs a boost to be competitive. Entrée, the plastic business card! They look great and last longer than their cardstock counterparts. The durability of plastic is perfect for industries that need waterproof or heavy-duty options. Companies that operate out of high humidity regions are also key candidates to take advantage of plastic business cards. 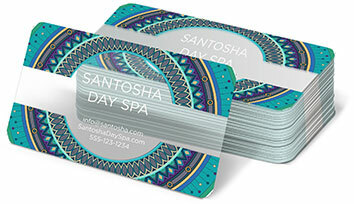 Translucent Plastic Business Cards: Clear cards that incorporate solid-color splash designs are dynamic and grab attention. Unique Identifier Codes: Printing your cards with coupon codes, which double as identifiers, allow you to track results. We also offer barcoding. Variable Data Cards: We offer the ability to print varying information on your plastic cards, including any sequential numbering. Custom Shapes: Choosing an unusual shape can increase the efficacy of your business card. Tipped Plastic Card Printing: Tipping refers to the color that you would like if you were to have your cards embossed (raised numbers or letters as seen on a credit card). We offer tipping in gold, silver or black. Scratch Off Plastic Card Printing: A great way to incorporate a call to action on your business card! Include a link or code for a discount. Now that's customer engagement! Unique Finishes: We can polish off your card with foil stamping or a nice matte finish. Writable Options: Do you want a signature block or the option to write on any portion of the card? No problem! Our matte finish is pen receptive. 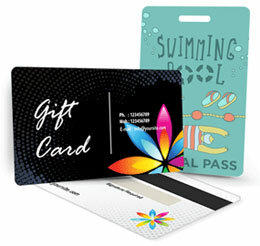 Magnetic Strips: We can provide gift cards and other load options with our magnetic strip feature. Our plastic business cards come in two sizes: standard credit card size (3.375 x 2.125 inches) and standard business card size (3.5 x 2 inches). The credit card size is larger and can hold more information, but the standard business card size looks and feels more like a traditional business card. Our standard plastic cardstocks come in 20 mil and 30 mil thicknesses, but we can also print on other, custom thicknesses. Design your business cards so they're uncluttered and the most important information can be gleaned at a glance. We recommend a minimum of 8pt type. The only type of font that can embossed on a plastic card is called OCR Standard. You've seen this font a lot - it's the font that is used for numbers and letters on your credit card. Business cards are a staple at networking events, but plastic cards have many uses beyond the traditional meet and greets. Because they're so durable, plastic cards are perfect for slipping into a wallet. Use them for businesses that people might need to call in a pinch, like mechanics and insurance agents. Plastic is also a good choice for take-along rewards cards and membership cards - just add a barcode or magnetic strip and you're ready to go. Need to write on the card? A writable surface can be added for signatures or anything else you'd want to write. Plastic business cards can happily withstand a sudden rainstorm or a dunk in the ocean. That makes them perfect for beach businesses, boating and skiing, and people who work outdoors. Clear plastic cards make a striking statement that people will marvel over, holding the card up and peering through for a closer look. We print your design as usual, but the "white space" remains clear or frosted for a see through effect. Use clear cards to make a design statement or suggest something about your product - like clear windows on a window cleaning service card. Plastic also pairs beautifully with other special effects. Cards can be foil stamped for a shiny glimmer, or die cut to produce intriguing shapes. Imagine a music store's plastic business card with silver accents and a punch out guitar pick that customers can really use. Plastic business cards are a unique and sturdy way to keep your business on people's minds and in their wallets. When you combine them with special effects, plastic business cards become truly noteworthy. 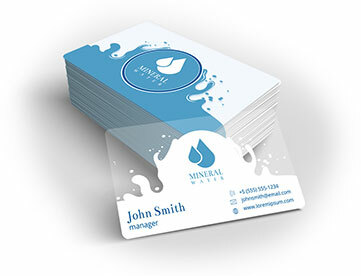 Plastic business cards offer many benefits and are worth the investment. Earning your business is our top priority. One of our experts is ready to help you make the best choices for your project and can answer all your questions. When you call you will find the knowledge, support, and top of the line quality that you deserve. Our plastic business cards are competitively priced. Get standard pricing or get a quote on custom options. We are dedicated to seeing your plastic card project be a success. For us, quality is the given and excellence is the standard. We aim to make your experience, from concept to delivery, the absolute best. Unsure of what you want? We understand, and will be with you through every step of the process. Call one of our friendly experts at 800-­930-2423. The outcome will be an amazing, professional business card that sets you apart. Have questions about printing plastic business cards?